We’re at the point now where you wouldn’t be surprised to see someone has changed the Wikipedia page for the St. Louis Cardinals, where under owner it now lists Christian Yelich. The Milwaukee outfielder and 2018 National League MVP has a 1.244 OPS against the Cardinals since joining the Brewers last season and over his career has a .329/.414/.702 slash line with 16 home runs. Eleven of those homers have come as a Brewer, including three on Monday night. We’ve done a StaTuesday on this before, but Yelich became the fourth Milwaukee player to record three home runs and seven RBI in a game, joining Aaron Hill (2016), Ryan Braun (2014) and Corey Hart (2011). In five games against St. Louis this season, Yelich has 16 at-bats and hit seven home runs. The most homers ever hit against the Cardinals in one season is 10 by Philadelphia’s Cy Williams back in 1923 (he had 28 at-bats). Ten players have hit nine dingers vs. St. Louis in one year, most recently in 2000 by Houston’s Richard Hildalgo. The others: Ernie Banks (1955), Dolph Camilli (1941), Tommy Holmes (1945) Ralph Kiner (1947 and 1950), Greg Luzinksi (1977), Willie Mays (1954), Wally Post (1956), Duke Snider (1956) and Hack Wilson (1929). 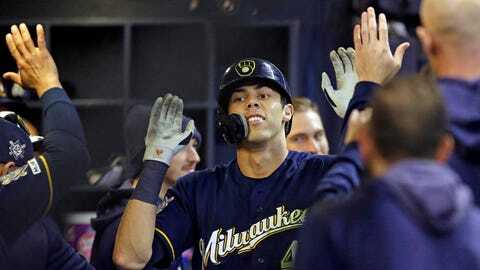 Yelich has a home run in all five games he’s played against St. Louis this year. Only some guy named Hank Aaron has done that against the Cardinals to open a season. Yelich’s streak of home runs against the Cards technically is six games — he homered against them (and tripled and drove in six runs) in a 12-4 win last Sept. 25 and then was walked five times the next day, never receiving an official at-bat or hitting a sacrifice fly. He basically wasn’t allowed to hit (St. Louis might want to think about revisiting that strategy). No other player in MLB history has a longer home run streak against the St. Louis. Six players hit a home run in five straight games — Jeff Bagwell (2000), Andres Galarraga (1996), Matt Williams (1993), Aaron (1972), Frank Howard (1963-64; like Yelich, he had a game in which he just walked during that streak) and Holmes (1945). Yelich isn’t the only Brewers player who hit a home run in six straight games against the same team. Teammate Eric Thames did it against Cincinnati. There’s been only 25 streaks of hitting a homer in 6+ games against the same opponent in MLB history. The record is nine straight games by another Milwaukee player — Joe Adcock of the Braves — in 1959 against Pittsburgh — and Minnesota’s Harmon Killebrew vs. the Athletics in 1961. The first two do it? Maybe no surprise, but some guy named Babe Ruth against the Athletics in 1922.